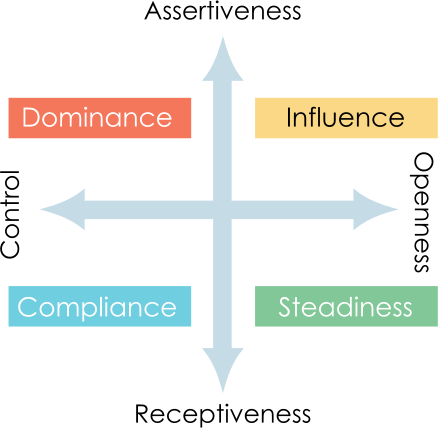 The two 'axes' of Assertiveness/Receptiveness and Openness/Control lie at the heart of the DISC profiling system. It might not, at first sight, be obvious how these two axes are related to the DISC profile, which, as we have already stated, contains four factors. This section endeavours to explain the connection. 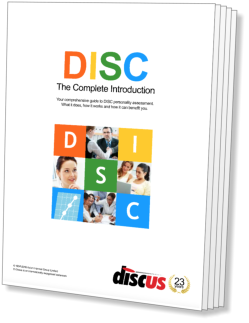 The link between the axes and DISC is the so-called Biaxial Model (i.e. a model with two axes). This is formed by the two fundamental axes when placed at right angles to one another (see diagram, above). The result is a cross shape with four empty spaces between its arms. 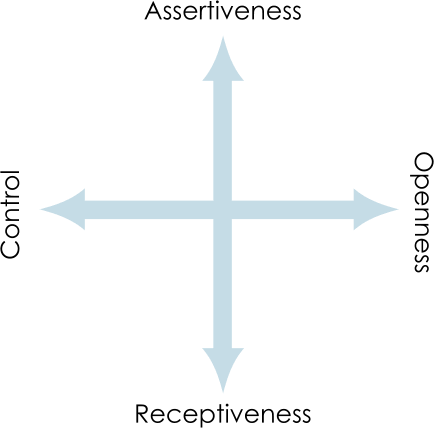 These spaces correspond to the four DISC factors, as shown below. So, each of the four factors is defined as a meeting point between two of the axes. Dominance, for example, can be defined as Assertiveness and Control. That is, Dominant individuals will show aspects of Assertive and Controlled behaviour in their approach to life. The four factors shown on this diagram are the same four factors that are shown on a DISC graph.